The Christmas season has officially begun - we had our first snowfall here in the Twin Cities over the weekend, and I saw the Guthrie's annual production of A Christmas Carol last night. 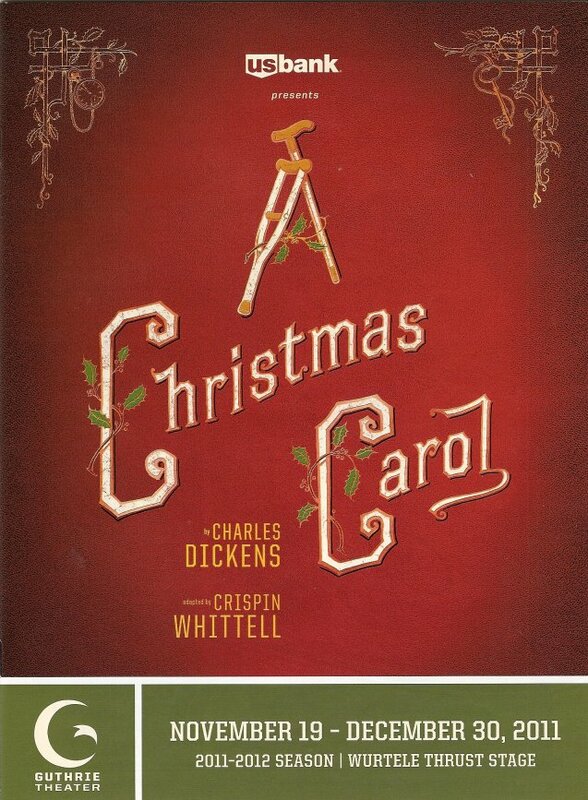 * And even though the snow might melt shortly, A Christmas Carol continues through the end of the year. So if you're looking for a way to get into the holiday spirit, this show will do it. The themes of Charles Dickens' classic tale go beyond any religion or holiday; being kind to everyone, spending time with the people you love, appreciating what you have in life, and sharing with those less fortunate are ideas we can all stand to remember at all times of the year. This year's show is fairly similar to last year's version, again using the new adaptation by Crispin Whittell and direction by Joe Dowling, with just enough tweaks to make it interesting for return customers. The fabulous set (by Walt Spangler) is the same as last year, depicting a street scene with shop windows and a revolving centerpiece to reveal the inside of the office of Scrooge and Marley. For the Fezziwig scenes a huge set of shelves with all kinds of goods rolls out for a backdrop. There's some pretty amazing engineering going on. Much of last year's cast returns, with some reshuffling and new blood added. J.C. Cutler is a very convincing Scrooge, especially in his transformation to the joyful, generous man dancing through the streets sharing his wealth and his love (read this StarTribune article to find out more about our Scrooge). Zach Fineblum was equally convincing in the reverse transformation. From the young open-hearted Scrooge to the miserly old Scrooge, he almost physically transforms before the audience's eyes. The fabulous Angela Timberman, aka Miss Hannigan, reprises her role as Scrooge's boozy maid. Kris L. Nelson also reprises his role as the loveable and hard-working family man Cratchit. It's a family affair again; his brother Lee Mark Nelson plays several characters including Mr. Fezziwig, and his wife Tracey Maloney plays the Ghost of Christmas Past, floating in on feathers and light to remind Scrooge of what he lost. Sam Bardwell was a bit of a scene stealer as the dim-witted party guest Topper and young Scrooge's friend (roles he also played last year). Other faves include Robert O. Berdahl as the jolly Ghost of Christmas Present, Suzanne Warmanen as the charming Mrs. Fezziwig, and Viriginia S. Burke as Cratchit's hard-working wife. Some of the dialogue about the rich vs. the poor sounds oddly current, including the rich man who insists on being called a "job creator." This production again features a flock of talented kids, some of whom I recognized and some of whom are new. What fun to be able to play make-believe in such a realistic way! As usual, the dancing at the party is wonderful (movement by Joe Chvala of the Flying Foot Forum). It's quite a feat just to manage the large cast of people moving in and out, and make it look smooth and natural. 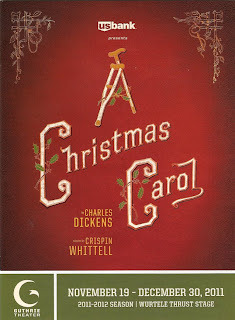 The Guthrie's all around top-notch production of A Christmas Carol is a Christmas card come to life. A Dickensian Victorian scene complete with dingy children begging on the streets, snow softly falling, a turkey and figgy pudding feast, carolers in bonnets and full skirts, merry dancing, mistletoe, and of course the famous phrase delivered by an adorable sweet-voiced child, "God bless us, everyone!" *I received two complimentary tickets to this play as part of "Blogger Night at the Guthrie." Very nice seats in the front row of the balcony, center stage, which provided a very nice overhead view of all the action on stage.